Centrally located in a highly sought after, yet quiet, area, this new and contemporary one bedroom apartment is fit for all. The property is located in a building block of 4 apartments all served with lift. 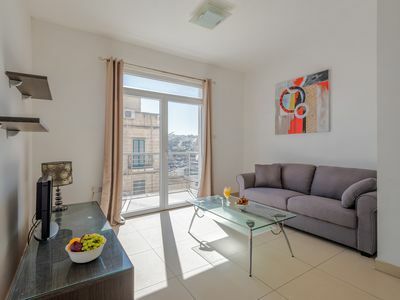 This 45sqm apartment is literally a few minutes walk away from the seafront which is full of restaurants, shopping centres, and also 10mins to Valletta by bus. Moreover, the apartment is walking distance to the National Swimming Pool. 500 metres from University of Malta and Malta's public Hospital (Mater Dei Hospital). A mini supermarket is conveniently located, literally a few doors down from the apartment. Free public parking and a bus stop nearby. 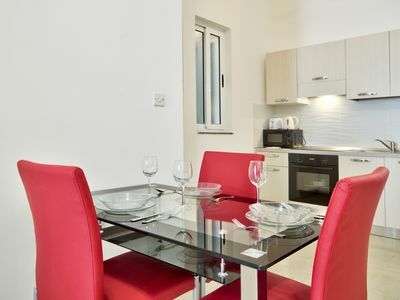 This fully furnished apartment comprises an open plan kitchen/dining/living area. The modern kitchen is fully equipped with all utensils. The living area includes a flat screen smart TV. Free wifi is available throughout the property. The apartment leads to a full air-condition bedroom with double bed, located at the back of the building to ensure a well reposed night. This apartment is very bright and airy having two private balconies located at the front and at the back. The outdoor seating makes it ideal for fresco dining during the eve or just enjoying the sun during the day. The property comes complete with as spacious family bathroom having both bath tub and shower cubicle. The apartment includes also an electric oven & hob, a washing machine, ironing facilities, shower/bath & more!